The only usable land border crossing between Georgia and Russia reopened Monday after more than three years of closure, restoring a vital route between Russia and the strategic South Caucasus. The crossing, known as Verkhny Lars in Russia and Darial Gorge in Georgia, reopened at 7:00 am local time (0300 GMT). The checkpoint runs through a narrow pass in the Caucasus mountains, about 170 kilometres (105 miles) from the Georgian capital Tbilisi, amid craggy snow-covered peaks. After a brief ceremony shortly before dawn, border police sat in roadside booths waiting, but no one was on hand to cross the border. It is the only land border crossing that does not pass through Georgia's Russian-backed rebel regions of South Ossetia and Abkhazia, which were the focus of the bitter Georgia-Russia war in 2008. The two countries late last year reached a deal under Swiss and Armenian mediation to reopen the checkpoint. The deputy head of the regional police, Giorgi Gegechkori, told reporters that the re-opening of the crossing was a step towards better relations with Russia, but only a small one. "It's a small step in that direction, but what really needs to happen is for Russia to end its occupation of Georgian territory," he said after attending the opening ceremony. The crossing will be open to citizens of countries in the ex-Soviet grouping the Commonwealth of Independent States (CIS) as long as they don't require visas for either Russia or Georgia. Georgian and Russian citizens will require visas to cross but will be unable to obtain them at the border. 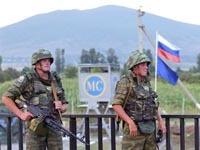 Russia closed the checkpoint in July 2006 in a move Georgian officials said was motivated by tensions over Tbilisi's efforts to build closer ties with the West. Armed conflict between the two ex-Soviet neighbours erupted in August 2008, when Russian forces poured into Georgia to repel a Georgian military attempt to retake South Ossetia. Russia later mostly withdrew to within South Ossetia and Abkhazia, which Moscow recognised as independent states, a move so far followed by only a handful of countries. The closing of the crossing dealt a heavy blow to Georgia's neighbour Armenia, which relied on the crossing as its only overland route to Russia, its key economic partner. Russia also cut air links with Georgia during the war, only four months after they had resumed following an 18-month embargo. Several charter flights were allowed to operate between the two countries in January, but full air links have not yet been restored. A new checkpoint was built on the Georgian side of the border last year with 2.4 million dollars in aid from the United States. "This facility is equipped with new modern equipment so we will be able to effectively ensure security on the border," Gegechkori said.